"Limoncello cake is refreshing cake great for a summer picnic or dinner. Quick and easy to make. A scratch cake that will impress your guests. My mom taught me how to make this cake." Preheat oven to 350 degrees F (175 degrees C). Spray an 8-inch square cake pan with cooking spray. Whisk sour cream, white sugar, canola oil, eggs, 3 tablespoons limoncello, and lemon zest together in a large bowl. Sift flour, baking powder, baking soda, and salt together in another bowl. Add flour mixture to sour cream mixture; stir with a wooden spoon until batter is just combined. Pour batter into prepared cake pan. Bake in the preheated oven until a toothpick inserted into the center comes out clean, 33 to 35 minutes. Cool cake in the pan for 5 minutes. 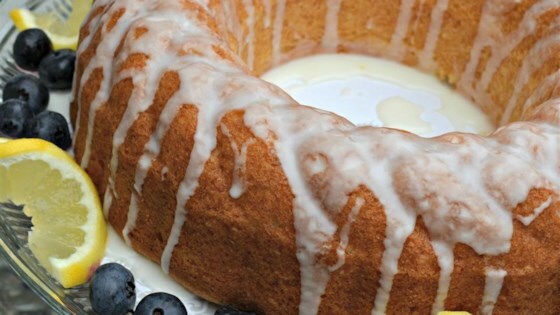 Whisk confectioners' sugar and 2 tablespoons limoncello liqueur together in a bowl until glaze is thin and smooth. Spread glaze over the top of the cake. Cool cake completely before slicing. For a double recipe, use 9x13-inch pan and bake about 40 minutes before checking for doneness. If the top of the cake browns too fast, lightly cover with foil. This cake was heavy and not moist.